There are few more beautiful, and dramatic, landscapes to walk in than the Bernese Oberland, Switzerland. 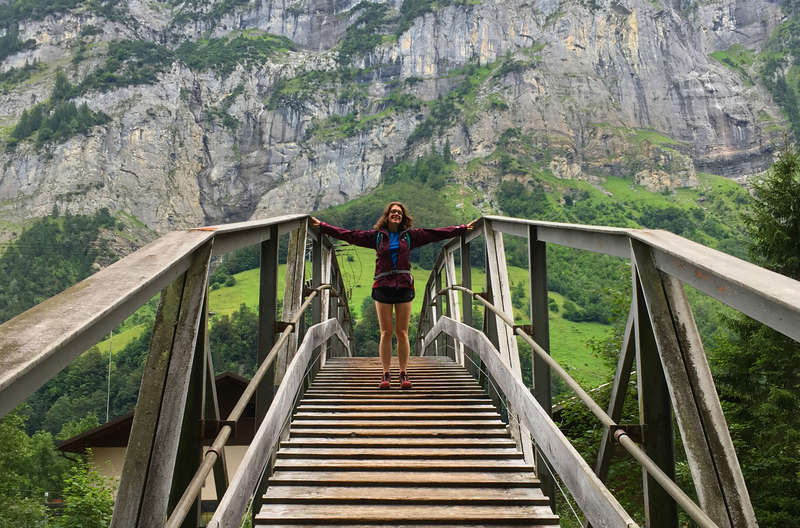 My guide to four breathtaking walks in this incredible region take in some of the absolute highlights, all in the shadow of the Jungfrau and Eiger mountains. Last summer we spent a week in the spectacular Bernese Oberland in Switzerland. There’s a lot to love about this mountainous region, but it’s also a funny one. The towns are neat and pretty and very Swiss, but they’re not all packed with character. It’s an area that’s been welcoming tourists for well over a century, but in places feels a little like its heyday has been and gone. There seems to be few people visiting to walk, camp and discover it’s wild wonders, yet many arriving to tick off photo opportunities and railway stations. You could look at this and wonder, is this really somewhere to come and explore the mountains? The answer is an emphatic yes. 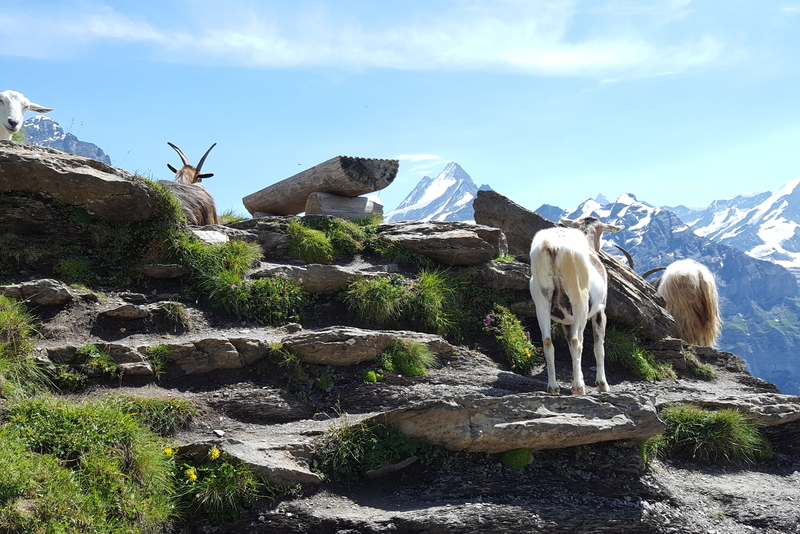 It doesn’t matter if the majority don’t fancy treading the mountain trails – you can adventure without crowds and enjoy the peacefulness of the alpine pastures. It doesn’t matter if camping isn’t the most popular choice here – you can enjoy great campsites, in stunning locations, without steep prices and often without having to book ahead. There’s an awful lot of reasons to give this region a chance. For me, exploring the walking trails of this alpine region were the highlight of our trip. And to be fair, one of the main reasons for coming here in the first place. Nothing makes this spectacular landscape feel more alive than the crunch of stone underfoot, the heady scent of pollen from pasture flowers, the gentle lolling sound of bells around grazing cow’s necks and the feel of sun on your back. Travelling slowly on foot gives you a chance to take it all in, spot the details and soak up the grandeur of it all – from the granite coloured peaks to the tiny alpine flowers peppering the meadows. So today I’m going to share my four favourite walks from our trip – and share the much-underrated side to this popular part of Switzerland. Want to know more about our trip to this region? You can read my itinerary for a perfect 7 days in the Bernese Oberland here. This post tells the story of some our hikes – but isn’t intended as a guide or map to help you reach these locations. If you’re planning on walking in this area, seek advice from the helpful folk at Interlaken Tourism who can point you in the direction of recognised routes. You’ll also find many well-signposted paths with distances estimated in hours rather than kilometres that will help you plan your own adventures. We’re experienced road and trail runners who tackled challenging paths in good weather. Remember, it might not be possible to replicate these routes on your visit. P.S. Don’t forget – if you’re planning a trip to the Alps this summer, check out printable packing list and advice for picking the best outdoor clothing for your trip in my guide to packing for the mountains in summer. There are dozens of routes that can be tackled from Interlaken, but this one is special thanks to the panoramic views over some of the iconic peaks and villages of the Bernese Oberland. At 2,076m, the climb to the top is not to be underestimated but is well worth it for the views over the Eiger, Monch and Jungfraujoch, and the valleys below. From Interlaken we took a relatively gentle walk to Wilderswil, a small village 2km out from the town at the foot of the mountain. 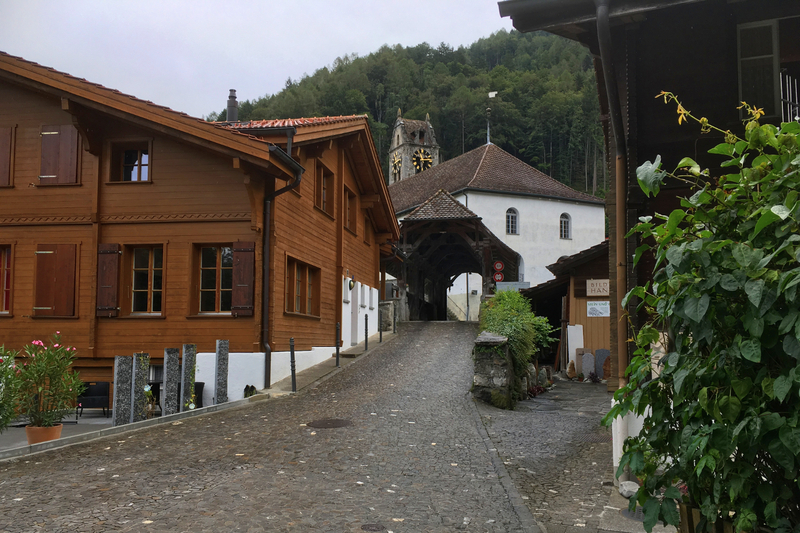 It’s a surprisingly pretty little village with considerably more charm than Interlaken itself, and an old centre dotted with ornamental chalets and a fantastic covered bridge. Wilderswil is worth a visit in it’s own right, but if you’re planning to tackle the mountain, it’s best to get started in plenty of time. A small path leads up into woodland from behind the church, and very quickly begins to steepen. At first, it weaves in and out of lush woodland and lowland pasture grazed by goats, ponies and the odd llama. Soon enough, you leave the meadows behind and the real climb begins under the cool dark trees. The woodland is ancient and impressive, but nothing compared to what you’ll find further up beyond the treeline. Occasionally, the mountain railway will cross your path as you head steadily up. When we tackled this route the day began wet and overcast, but after an hour or two of climbing, as the trail headed upwards at a considerable rate, the sun began to break through the trees and cast dappled light across our path. We could tell that the forest was thinning, and before long the path ahead rose out of the tree line and into high alpine meadow. While not an accurate half-way mark, the journey up is broken by the delightful discovery of the small railway station at Breitlauenen. The station is nestled between a dairy farm and a smattering of chalets, high in a meadow. 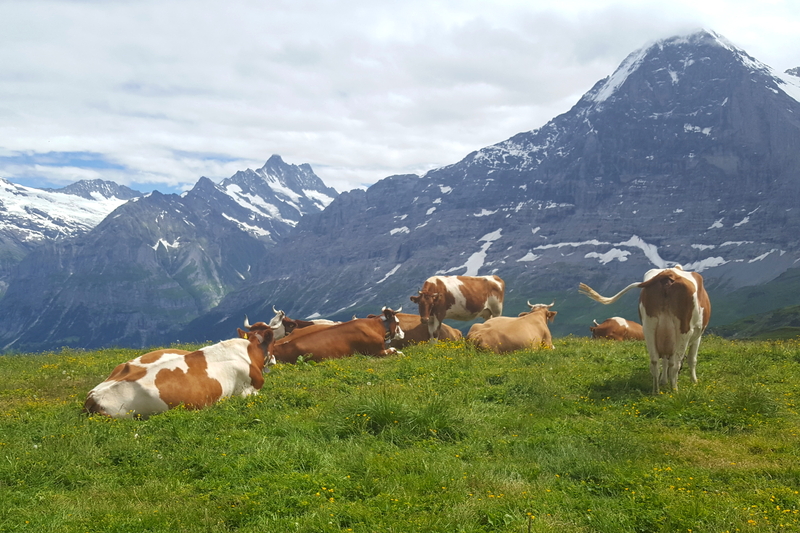 It’s the most wonderfully idyllic spot, with breathtaking views down over both lakes Brienz and Thun, and the gentle low-pitched ring of cow bells from cattle grazing all around. The station master spends most of her time chasing chickens and sleepy cats from the line whenever a bell rings and a distant rumble warns of an impending train. From here, the climbing is less steep but you pass in turn through woodland, meadow and along rocky paths that increasingly test your courage as you encounter a few vertiginous drops to the side of the path. You move more slowly, but the views more than make up for it. All of a sudden you round a corner and find yourself at the station and the summit. You’re now looking down on the Grindelwald valley and the mighty Eiger at it’s head. It’s a nice spot to stop at and simply take it all in. There are alpine gardens to meander around near the station and a cafe if you’re in need of something cold and refreshing. It is possible to complete the climb and make it back down within a day, but for us an impending storm was closing in. The scurrying clouds and dark skies looked incredibly dramatic from this mountaintop viewpoint, but we needed to take the safe option this high up, so descended quickly to Breitlauenen just as rain started to fall, and sheltered in the wonderful quaint waiting room of the station until a train came along to take us back down to valley floor. 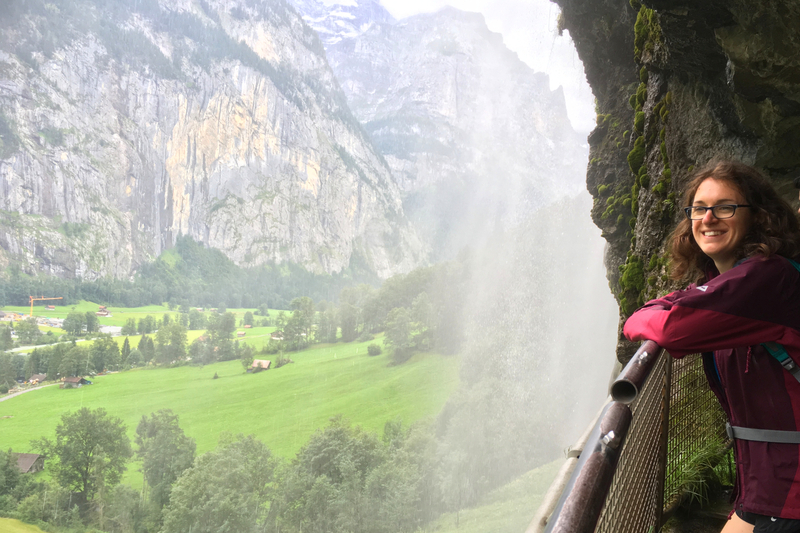 This walk is a good way to get a feel for the magical valley of Lauterbrunnen. Starting just outside Lauterbrunnen, we steadily meandered our way along the flat valley floor and through lush green fields in the direction of Stechelberg, at the head of valley. 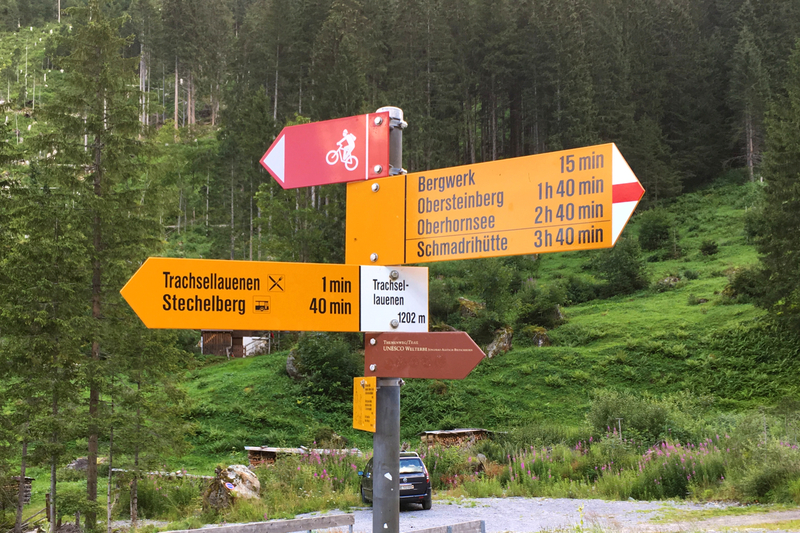 A quieter access road runs parallel to the main road (that mostly serves the Trummelbach Falls and gondola lift at Stechelberg), and you’ll find it largely empty aside from a few other walkers and the odd farmer. 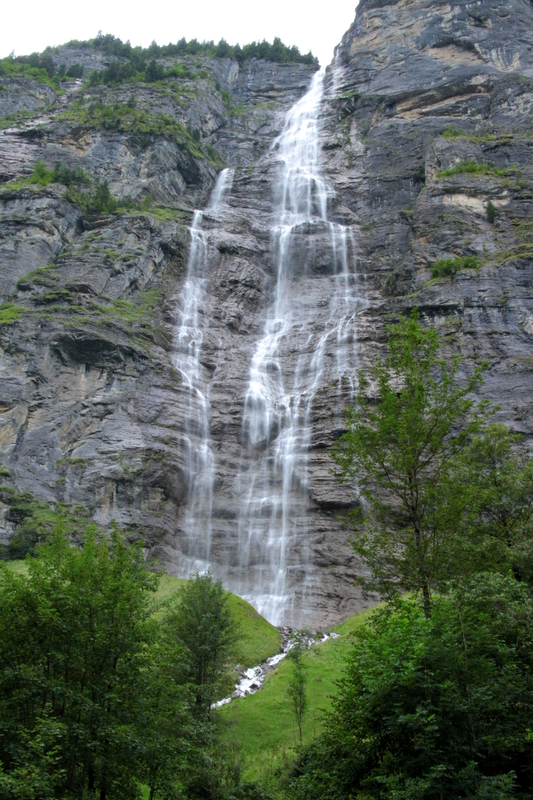 This alone is a beautiful walk, with some of the highest and most spectacular waterfalls in the whole valley as you approach to the small hamlet at Stechelberg. Between the crescendo of falling water and the roar of the river there’s quite a dramatic atmosphere. Once in Stechelberg you have the choice of taking the gondola (cable car) up the mountain (services run throughout the year) or taking the old path up through the forest. We opted for the latter and began to scramble up the winding rocky path alongside a crashing waterfall. The path widens out after a short but steep climb and heads steadily uphill. After a couple of kilometres, the path emerges from the trees and chalet roofs start to pop up through the pasture. You’ve reached the edge of Gimmelwald (where you can also jump out at the mid-station of the gondola). Gimmelwald is one of the most unspoilt alpine villages in the Bernese Oberland, in part because it’s one of the least accessible. It’s car-free, and mostly little farms and a cheery hostel. The village is perched on the edge of a hanging valley facing the imposing Breithorn mountain, which can be seen the length and breadth of the Lauterbrunnen valley. It’s a peaceful spot with just other hikers and few goats for company. Many of the farmhouses here sell produce from their front doors, so we indulged in fresh milk and the local Alpkäse cheese – thick and creamy and delicious beyond belief after our climb. From Gimmelwald a paved road leads gently uphill without much of a view to hint at what’s beyond. What lies ahead is the picturesque and affluent ski resort of Mürren – a paradise of immaculately-presented Swiss chalets with balconies laden with cherry-red geraniums in August, cosy restaurants peddling hearty cuisine and jaw-dropping views across to Wengen (on the opposite side of the valley). We stopped and spent a little time exploring, and enjoying the welcoming atmosphere and an Alpkäse sandwich or two. You can return back down to the valley by mountain train or on foot from Mürren. The little train brings visitors and their luggage up the mountain from the main station in Lauterbrunnen and takes a scenic route winding through woodland. We took the forest road down on foot – a considerably longer walk than our route up but the road was much gentler as it wove between pastures and dense forest. 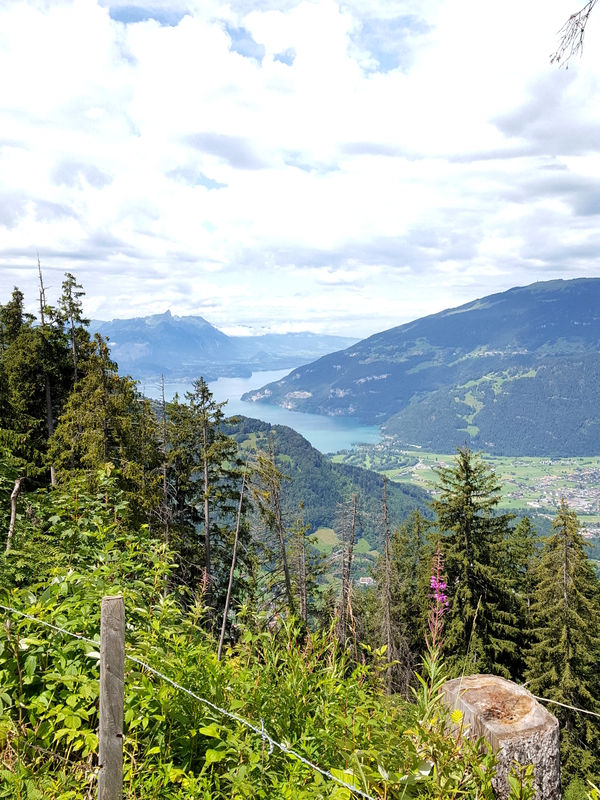 As you head back down into the village below, views open up towards Wengen, high on the opposite side of the valley and also towards the far end of lake Thun, glistening in the distance. The last part of the descent back down into Lauterbrunnen is steeper, but the sound of cow bells and the spire of the village church in the distance guides you into town. Put your feet up and enjoy a well-earned coffee and slice of cake at Airtime, a vibrant little cafe at the heart of this pretty but quiet village. Truth be told, we weren’t blessed with good weather on our trip to the Bernese Oberland, in spite of it being summer. But the day that we tackled this route the sun finally came out, blazing all day long and leading, inevitably, to moderate sunburn and excessive photographing of alpine pasture. This route was probably the one I enjoyed most during our week here, as it climbs out of the Lauterbrunnen valley and into the Grindelwald valley, tucked away behind high peaks. It brings you unbelievably close to the Jungfraujoch and Monch. Craggy rock faces topped with snow fill the horizon whilst you stroll short-sleeved through warm, flower-filled meadows. As with the previous routes, there’s the option to take the mountain railway almost all the way to the top here, with stations at Wengen and Kleine Scheidegg, so you can adapt the route to suit your fitness and enthusiasm. Starting in Lauterbrunnen, we tackled the first path of the day, steeply, up through the trees to Wengen. It’s not a long walk but it was one of the most strenuous. Eventually you’ll be rewarded by the arrival of Wengen on the horizon, with it’s panoramic views and cheerful atmosphere. Like Mürren, Wengen is a ski resort with a long heritage. It hosts one of the most prestigious events in the World Cup series, and has a younger and more vibrant feel than it’s neighbour on the other side of the valley. You’ll find more chocolate-box chalets and grazing cattle here, but also a lively main street with cafes, bars and shops. After you’ve explored Wengen, it’s time to head higher for the serious views. A forest road takes you up and away from the resort centre, heading towards Kleine Scheidegg at the col which sits between the Lauterbrunnen and Grindelwald valleys. The climbing isn’t too hard here, and before you realise it you’ve risen out of the trees and are facing towards the snow-capped Jungfraujoch in all it’s glory. Kleine Scheidegg is a couple of kilometres from Wengen, sitting atop a little lake with a railway station and cluster of hotels and restaurants. 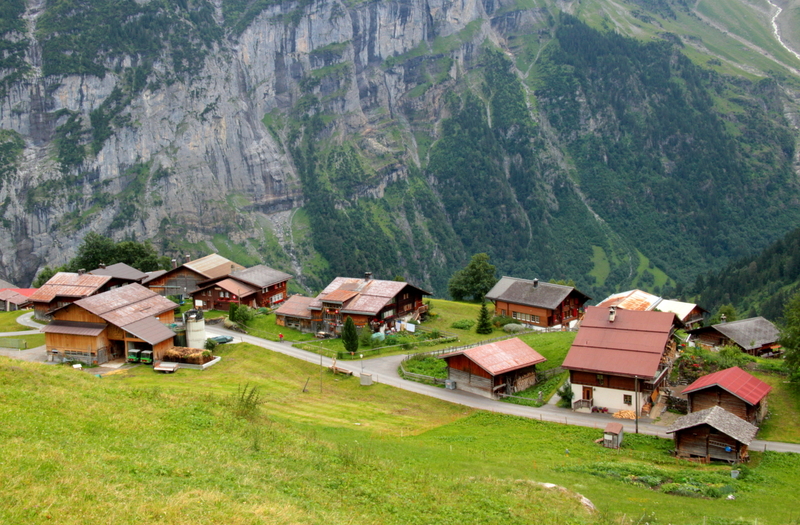 It’s a real little community and meeting point for hikers coming up from both Wengen and Grindelwald, and well as tourists exploring on their return from the Jungfraujoch. But if you stop here and head home, you’ll have missed the chance to experience one more stunning views over the valleys – from Männlichen. A winding but largely flat path heads from the station in the direction of this peak that sits directly above Wengen. From here you can see not only see where you’ve come up from in Wengen and the valley, but also look down over lake Thun. The Männlichen gondola makes for an exciting descent back into town after a long day on your feet. 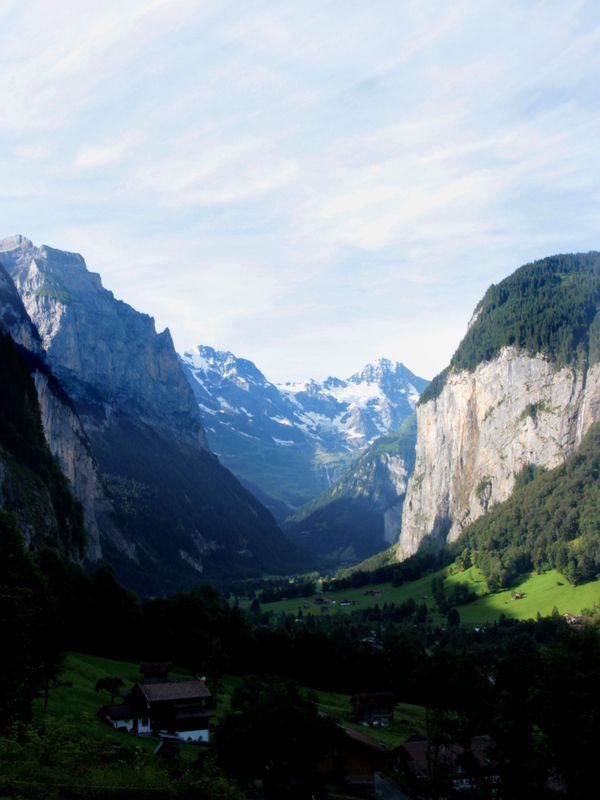 The last hike of our trip to the Bernese Oberland was from the luscious Grindelwald valley up to First. It gives you a chance to view the magnificent Eiger and it’s glaciers as you climb higher, and there are hidden treats in the form of high alpine lakes and glaciated landscapes to capture your imagination. A trail rises up from centre of town at first on quiet road, and then on path and forest road, roughly following the route the gondola takes to First. The gondola crosses over the path high above your heads in places, whilst you weave between pasture and deep green woodland. About midway, you reach the little hamlet of Bort, where the path suddenly widens and emerges into a bowl with a deep blue lake crowned by a couple of mountain restaurants. 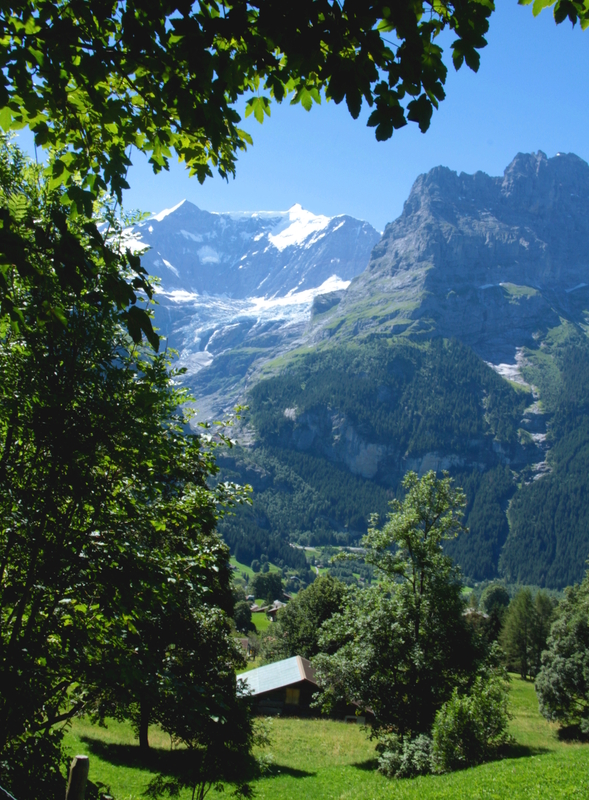 You’re edging closer to the Eiger here, and the trail breaks out of the trees for the remainder of the route. The last part of the climb is hard work with tired legs, as ours were after a week of hiking. But the views were breathtaking, and stone water troughs spouting little cascades of cold, fresh spring water meant that we could refill our bottles in an attempt to keep cool. As you approach the summit the mountainside gently rolls away to your right, with curious shapes and hummocks in the landscape a legacy of glaciers working their magic over thousands of years. This is the most peaceful part of the walk, as most visitors choose to take the gondola all the way to the top from Grindelwald. Reaching the peak at First in itself is impressive – views open up across the whole of the Grindelwald valley with the Eiger to your left, Kleine Scheidegg with the pass over to Wengen and the Lauterbrunnen valley ahead, and Schynige Platte to your right. Into the bargain, you’ll find a skywalk to explore, letting you circle the cliff faces below the lift station with nothing but glass under your feet. 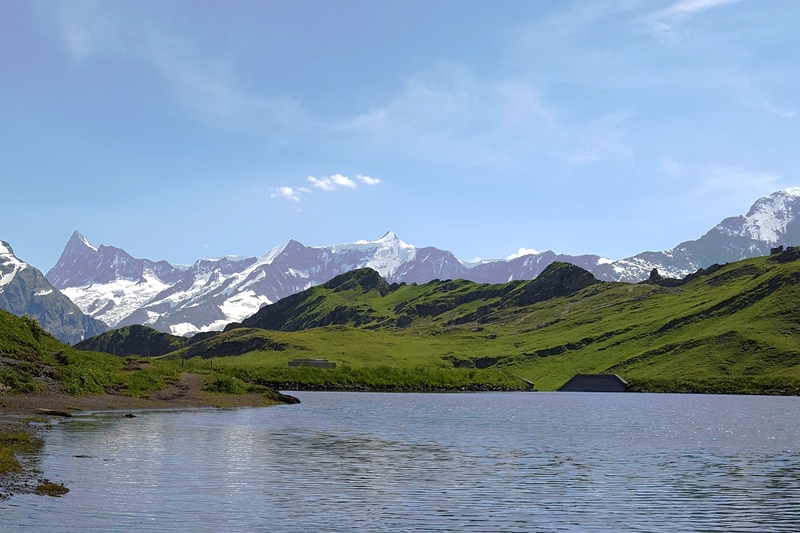 But the real reason for coming is to see Bachalpsee, a gentle walk of a couple of kilometres from the summit. I could describe how beautiful Bachalpsee is, the peaks all around are reflected in deep turquoise waters, but I think the pictures go someway to doing it justice. Whilst most walkers choose to head back to the lift station at First from here, or onwards to Schynige Platte, we chose to take a combination of footpath and forest road back down into Grindelwald. The path down from Bachalpsee to meet the forest road was one of the most glorious areas of pasture I’ve ever explored. Little streams trickle down from the lake, babbling amongst the stone and meadow flowers, whilst cattle and goats graze quietly, obvious to the majesty of their home. Once you hit the forest road it’s a steady, easy to follow route that soon plunges back down into woodland and dense forest in places. It eventually brings you out just above the centre of Grindelwald, where you can meander back into town. We were exhausted. After a week of walking almost all day, every day, we felt we’d packed in as much as we absolutely could. But there’s still room for more – a week felt more like an appetiser for the region. It might not be any time soon but I’ve no doubt we’ll be back, ready to spread our wings a little wider and discover some more peaks.